Dr. Sri recently corresponded with CWR about what discipleship is and isn’t, understanding Jesus as “rabbi”, avoiding using orthodoxy as an excuse, the nature of true conversion, and the four habits of a disciple. CWR: In your experience, what are some of the common misconceptions or misunderstandings about discipleship? Part of the problem might be a lack of a consistent vision and firm grounding in what the Bible says about discipleship. It can happen that individuals, parishes, apostolates or diocesan leaders might each come up with their own take on discipleship, but sometimes those approaches are not as shaped by God’s Word as they could be. Imagine, however, if we offered parish leaders a more robust picture of discipleship—one truly shaped by Scripture, Jesus’ public ministry and the Church’s teachings on evangelization and catechesis? This exciting Biblical model for discipleship would equip pastoral workers with a powerful framework for evangelization and faith formation. CWR: What are some basic, biblical points about discipleship that you emphasize and reflect upon in the book? Dr. Edward Sri: If I had to pick one key Biblical word that sums up discipleship, it would be imitation. When a disciple followed a rabbi, the goal wasn’t merely to master the rabbi’s teachings but to imitate the way he lived—the way he prayed, studied, taught, served the poor, and lived out his relationship with God day-to-day. Jesus himself said when a disciple is fully trained, he “becomes like his teacher” (Luke 6:40). And when St. Paul formed disciples of his own, he exhorted them not just to remember his teachings, but also to follow his way of living: “Be imitators of me as I am of Christ” (1 Cor 11:1). And that brings us to the heart of what it means to follow Jesus. Am I intentionally striving to deepen my friendship with Him? Am I endeavoring to live like Him? A disciple is always looking for that next step of faith. It’s not just about going through the motions of faith—showing up at Mass, throwing money in the basket, and trying to be a “nice person”. A disciple aims for much more. Through a regular life of prayer, sacraments, fellowship and faith formation, a disciple intentionally seeks to take on the mind and heart of Christ—to think like him, serve like him, love like him. CWR: Why did you focus on Jesus as “rabbi”? How does that term, which is somewhat foreign to most Catholics, challenge and help us in becoming better disciples? Dr. Edward Sri: The rabbi-disciple relationship helps contextualize our faith in a more personal, dynamic way. Catholics often hear exhortations like “Live out your faith!” “Be a good Catholic.” “Grow in holiness.” But what does that look like? Those words can sound abstract to many people in our pews. After all, how do I know if I’m growing in holiness? There’s not a holiness thermometer I can take to check my spiritual progress and say, “Wow, this week, I’ve grown in 15 degrees of holiness!”. A. The truth about himself: his many weakness, failures and areas where he falls short of living like Christ. B. The truth about what he’s made for: being conformed to the image of Christ, living like him, thinking like him, loving like him. A true disciple knows what he’s made for: transformation in Christ (B). But he also knows the many ways he falls short (A). Discipleship is all about moving from A to B, from where I am now to where God wants me to be. So when our Catholic Tradition speaks of “growing in holiness,” “pursuing sanctity” and “becoming saints,” it’s basically describing Biblical discipleship—this life-long process of being ever more transformed by God’s grace, being changed into Christ’s likeness “from one degree of glory to another” (2 Cor 3:18). CWR: You write about “orthodoxy as an excuse”. What are some examples? What can be done to address that sort of excuse? Dr. Edward Sri: Following the right doctrines and practices of the Faith is absolutely essential, but sometimes we can pat ourselves on the back for our orthodoxy, as if that gives us a pass from the serious pursuit of holiness. A good basketball player, however, has to do a lot more than merely follow the rules. Staying in bounds and not double-dribbling doesn’t make one an NBA All-Star. That’s just permission to play. And similarly, merely upholding the teachings of the Church doesn’t mean you’re a saint. It’s just the basic starting point for the Christian life. The real question is whether we are earnestly striving to live more like Jesus in all areas of our lives—“to think like him, to judge like him, to act in conformity with his commandments, and to hope as he invites us to”.1 Being a disciple entails a lot more than saying and believing the right things. It’s a whole way of life—his way of life transforming me. CWR: You emphasize, in several places, that grace—sanctifying grace, specifically—is “Christ’s divine life in us.” Why is this truth so vital to the process and reality of discipleship? How can it be better grasped and appreciated? Dr. Edward Sri: One big advantage we have as Christian disciples is that our rabbi, Jesus, dwells within us. He’s is not just an example to imitate from the outside like other rabbis. The One whom we seek to imitate abides in us through sanctifying grace. We really have the life of Christ abiding in us, prompting us, strengthening us, helping us to live more like him. So as Christian disciples, we don’t just walk in Christ’s footsteps. It’s more like He is walking in our shoes, helping us to take the steps of faith we could never do on our own. Growth in the Christian life is all about learning to rely on and cooperate with God’s grace. As we strive to imitate Jesus, we quickly realize how weak and incapable we really are. We realize the Nike approach to spirituality simply doesn’t work. We can’t do it—not on our own. We need Jesus to help us: to heal our wounds, weaknesses and sins and to help us be more like him—to love with His love. This is the transformation Jesus wants to work in his disciples. He wants to re-produce His life in us. CWR: How would you describe conversion? Is it a singular event, a process, or something else? 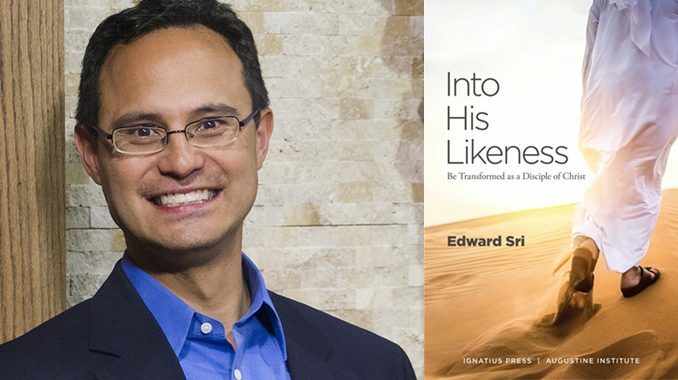 Dr. Edward Sri: In the Bible the word “conversion” describes a turning around—turning away from sin, self and the ways of this world and turning our lives toward Christ. The Church describes it as saying “Yes” to Jesus, surrendering our lives to Him and taking on a profoundly Christian outlook on life. This often involves a significant turning point in one’s life, when one puts Jesus first before all other things and aims to have Christ shape his entire life. But this initial conversion moment doesn’t transform someone into a saint overnight. Conversion is an ongoing process of becoming ever more centered on Christ. Think of what happened when Jesus called Peter to leave his fishing nets behind and follow him. Suddenly, Peter’s life is dramatically changed. He has become a disciple—someone whose entire life is now oriented around Jesus. But this initial conversion was just a beginning. There was still a lot of work to be done in Peter’s soul. Peter needs to grow in understanding, trust, faithfulness and love. The enthusiastic Peter will often misunderstand Jesus and even deny him three times! Yes, Peter sincerely loves Jesus, but his love is far from perfect. He needs to be healed, transformed and perfected by Christ, and that happens over the course of a lifetime. Eventually, Peter will, indeed, exhibit that perfect love when he dies for his faith in Jesus, crucified in Nero’s circus. What Jesus did in Peter—taking Peter’s weak, human love and transforming it with perfect divine love—He wants to do in all disciples. He wants to change us into his likeness from one degree of glory to another. (2 Cor 3:18). CWR: In your book you mention four key habits of a disciple. How are these practical, regular ways to be transformed as a follower of Christ? While there are many creative ways one could sum up the various practices of a disciple, following the Biblical model is best. For when the Church has summed up the Catholic Faith, it has often turned to these four points in Acts 2:42 to help categorize what it means to follow Jesus. In fact, the four pillars of the Catechism of the Catholic Church are traditionally seen as based on these four points. So if we want a roadmap for faith formation to make sure we’re helping deepen people’s relationship with Jesus—if we want to keep their fire of faith growing—think of these four points from Acts 2:42 as logs we add to the fire. These are four foundational “encounter moments” in the life-long journey of a disciple. The more we grow in prayer, live in fellowship with our neighbor and the poor, frequent the sacraments and form our minds with the revelation of Christ, the more we encounter Jesus ever anew. CWR: There’s a greater emphasis today on going out to the peripheries and reaching the “nones.” But what about the people coming to our parishes? Do they need to be evangelized, too? Dr. Edward Sri: Absolutely. And the discipleship theme makes that clear. It sheds light on the gap oftentimes existing between a more cultural Catholicism and a faith lived out vibrantly in daily life. There may be people who show up at Mass every Sunday, volunteer at the parish and even sing in the choir, but are they living as disciples who strive to imitate Christ? Have they had a personal encounter with Christ that has shaped their entire lives? They might go through the outward motions of faith, but have they surrendered their lives to Christ (cf. GDC, 53-54), said “Yes” to him (cf,. CT, 20) and taken on “a profound Christian outlook” (GDC, 58)? 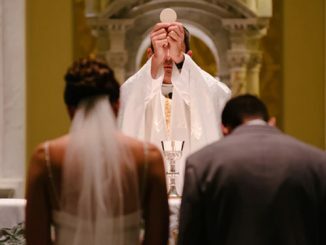 Is the way they think about love, marriage, success, happiness, moral truth and the meaning of life, for example, shaped more by the media than by the Gospel? 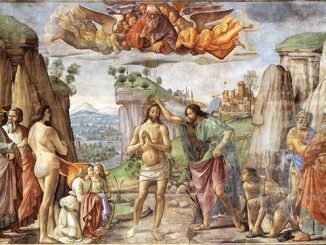 As St. John Paul II explained, many of the baptized have “accepted a secular model of thinking and living” (RM, 33). So right within our parish walls, God is placing people whom he wants us to evangelize and call to discipleship. 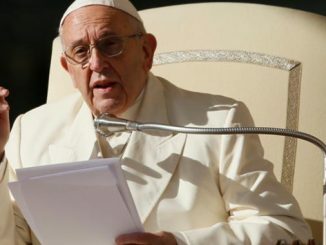 Do we have an urgency about leading our parishioners to become more than Catholics who go through the motions of faith? Discipleship reminds us to form true followers of Jesus who seek to draw closer to Christ and become more like him and avoid settling for their being registered at the parish and making appearances each Sunday. 1 St. John Paul II, CT 20.